The Treasurer is in the office on Monday through Thursday from 8 AM to 4 PM. Additional hours may be added during tax collection season. For the 2018 tax deadline, the Treasurer will be in the office on Friday, September 14th from 8 am until 4 pm to collect taxes. Any taxes that are not turned in by 4 pm on Friday, September 14th are considered delinquent and will be collected by Livingston County Treasurer. 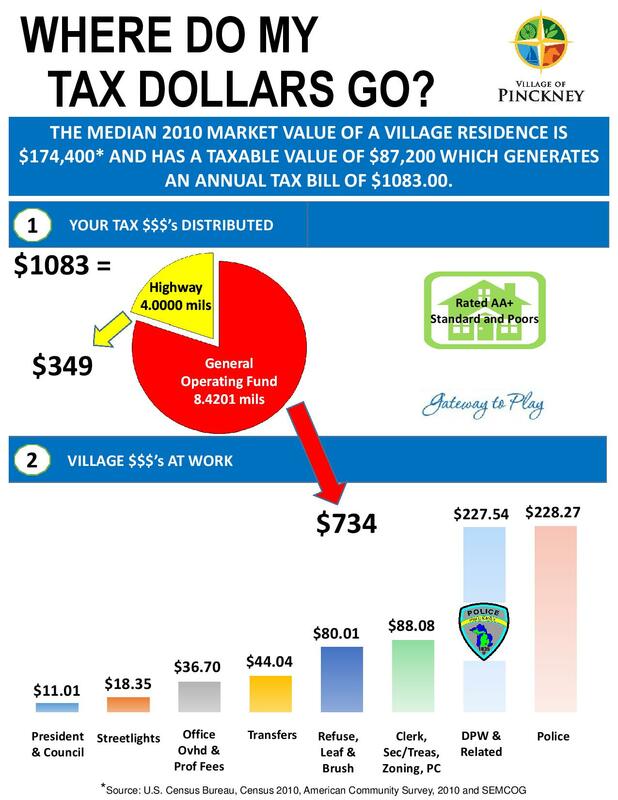 The Village of Pinckney levies a total tax of 12.3175 mills – 8.3175 mills for the general fund (general village services, including the police department) and 4 mills for general highway (street maintenance and improvements) for the Summer 2018 tax. The 2018-19 budget document can be reviewed here along with charting showing revenue and expenditure trends. 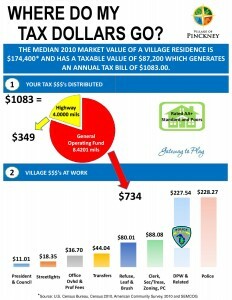 The Village of Pinckney only collects Summer tax. To check your taxes online, click here. You will be asked to create a login and will be able to access tax information. This service is provided free of charge to Village residents only. All other users will be charged a small fee. There are several SADs in the Village. If you have questions on an amount due or a payoff, please call the Treasurer during her regular business hours. You can pay your taxes using a credit card by calling 1-800-272-9829 or by going online to www.officialpayments.com. Pinckney’s jurisdiction code is 7048. A 3% fee will be charged for using this service. After September 14th 2018, the Village will forward delinquent taxes to Livingston County for collection. Please contact the county treasurer’s office at 517-546-7010 regarding late payments of taxes, including fees and interest penalties. 4) A totally and permanently disabled person. Deferment can only be filed and dated from 7/1/18 to 9/14/18. Deferments must be filed annually. Postmarks will not be accepted. State of Michigan – Public Act 530 Summary can be found here. View the Municipal Financial Summary for the Village here at ‘Access My Gov’.